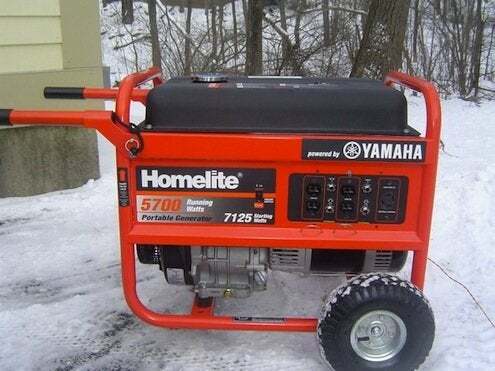 With all the crazy weather events we’ve been having, portable generators are more popular every day, but you need to think ahead before you use one. You’ll need a supply of gasoline safely stored in rated containers. Allowing the generator to run out of gas will damage it, so be sure to remove the electrical load before you shut it down. Let it cool down before refilling the gas tank: spilling gas on a hot generator gets very dangerous very fast. Gas isn’t the only thing you’ll need a lot of. A new generator needs an oil change after the first 25 hours, and every 50 hours or so after that. Stock up on enough oil and filters to run it for at least a few days. To mitigate the noise factor, you can park your generator away from the house, but not too far. Use heavy-duty twelve-gauge extension cords and keep the run to less than a hundred feet. Running your generator for twenty minutes every three months or so will keep the starter battery charged and ready for action when you need it! Home Generators: To Have or To Have Not?